Weekly Inverse AUDUSD giving strong buy signal. The momentum at inverse appears waning and an ultimate return to over .80 appears viable after potential weekly stops at .75 and .77 Supporting a short squeeze, reportable traders data places market in net short state. the pound looks like it could be strong this year. 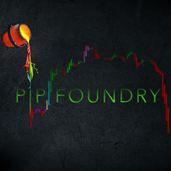 Weekly bitcoin trend with Pip Foundry. Just trading the divergences in london. Indicators are available for lease at www.tradingview.com Pulled short on printed bullish "divergence alert". Weird day on fiber. Only a 60% retrace on this rally and were back at last nights short area on divergent momentum. I will wait for London open to make an entry. Indicators are available for lease at www.tradingview.com Higher timeframe bearish london entry. Confirmed with 5 minute printed bear div after entry and classic bearish divergence on hourly and higher in momentum. Looking to take profit on 5:1 at 1.0850 and as this trade is *with the trend* I will leave a 20% runner on tgt achievement. BITCOIN - test the bullish range! litecoin/bitcoin. are you sure you want to short this? I want to see the little divergence turn into more distribution here.